Looking for rock solid stability and dead-on accuracy in a fixed sight? Troy Industries Di-Optic Aperture (DOA) fixed sights get the job done with an advanced design, superior sighting ability and battle-ready toughness. These sights provide lightning fast target acquisition and are manufactured to exceed military specs. The optically engineered Di-optic apertures center your eyes instantly and effortlessly providing a clearer target picture than with round apertures. 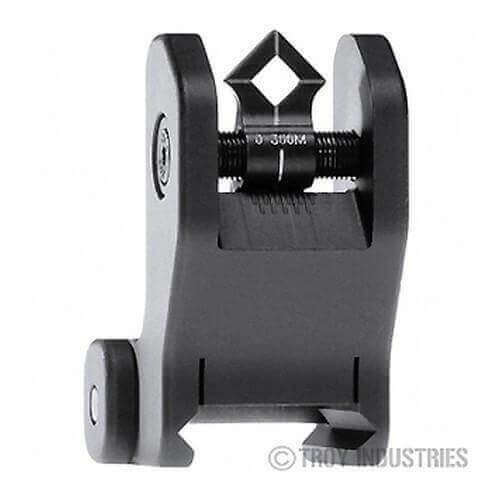 The sights feature two settings, one for up to 300 meters and a second for up to 550 meters. This versatility makes the DOA ideal for military, law enforcement and home defense applications. These advanced sights have been extensively field-tested and, like all Troy Industries products, are Battle Ready. Count on it. AT3 Tactical did a great job. I had no issue, and will certainly buy from you folks again. As far as the sight, well just as I feared. I've never did well with peep-sights, and thought I'd give this style a try. Needless to say the sight is now in my bin of spare parts, and I'm back to looking for a "open" rear sight. I can't fault the sight, as it is more of an issue with me than it. I am excited to get my Troy fixed, front and rear sights mounted on my weapon. I have not had a chance to use them yet, but am comfortable and excited about my purchase thus far. I would have easily given them 5-stars, but was a little disappointed to find surface rust on the rear sights. I also discovered a lot of rust on the enclosed front sight adjustment tool. Not what I expected to find.